White : Creamy , buttery gravy cooked with cashew nuts, almond and freshly ground herbs. Brown : Spicy Gravy cooked with a blend of cashew nuts, almonds & fresh Indian spices. Korma Takeaway Lanzarote There are 4 products to choose from. 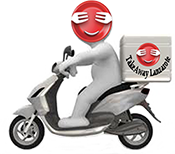 Takeaway Lanzarote - Restaurants Puerto del Carmen Indian Takeaway Lanzarote, Indian Restaurants takeaways , indian food delivery Puerto Carmen - Best Indian Restaurants Lanzarote with Delivery Takeout Canarias Las Palmas.